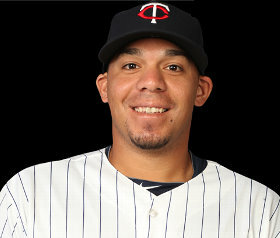 Prior his call-up by the Twins last month, Rene Rivera last played in a big league game on September 26, 2006. Back then, the space where Target Field stands today was a parking lot, Brad Radke was the Twins No. 2 starter, Brad Johnson was the Vikings starting quarterback, Kevin Garnett played his home games at Target Center and Brett Favre was the most popular man in Wisconsin. Rivera meanwhile, has appeared in 313 minor league contests for five different organizations since he suited up for the Mariners that day. Through sheer determination and perseverance, the 27-year-old finds himself with the Twins making a case to supplant Drew Butera as the team’s back-up catcher when Joe Mauer returns from the Disabled List sometime (hopefully) this month. The journeyman backstop and I discussed his baseball odyssey last week during the Texas series at Target Field. DZ: You’ve been here a little over a month now I guess, what’s it been like for you? RIVERA: I like it. I am having fun, this is the place I want to be. We’ll see what happens in a couple of weeks. I enjoy everyday of my life up here, so we’ll see what happens. DZ: When you’re in a position like you and there’s a player like Joe Mauer that’s going to be eventually coming off the DL, do you just try not to think about that and take it one day at a time? RIVERA: Yeah, I always take it one day at a time. You can’t think about it…I just let whatever happens happen and live day by day. Who knows what will happen when he comes back. We’ll see in a couple of weeks. DZ: You had a little big league experience, but it was five years ago. During all of that time, did you ever doubt you’d be back here? RIVERA: It was tough, a tough time. Those five years have been up and down and I just kept grinding, kept playing. I knew that someday it was going to happen. So, I never gave up, I never took a step back, I just kept playing baseball…I knew that I was going to play again in the big leagues. I worked hard for that and this year I got the chance. I took advantage of that and will keep playing hard. DZ: When you are gone for that long, does it kind of feel like you are a rookie again when you get back up here? RIVERA: In the beginning it did feel like it was my first call up. Once I got up to bat, I knew I could play and catch a good game. I knew what I was capable of doing and did my best when I was in the lineup and played hard. DZ: Other than the guys you played with at Rochester before this year, did you know any of the other Twins players? RIVERA: I played with a couple. I played with Drew (Butera) back in winter ball. We played on the same team. Who was the other one? (pauses) Justin Morneau, I played with him the Puerto Rico league too. That’s about it. I saw those guys playing in and faced them a lot in my career in the minor league, but I never had the chance spend time with them so I am taking advantage of that…I am having fun. DZ: Going back to the offseason, you were a free agent. What attracted you to the Twins, why did you decide to come to this organization? RIVERA: It’s a great organization. I liked the organization from the past. People talked good about it, all of the players talked good about it, so it was the place to come (to). My agent and I picked this organization to come to and give it a shot. DZ: Did you know going in that if you are in the minors and playing well and they need somebody, they’ll call you? RIVERA: Yeah, that’s what I mean. You know, we got the reports a lot - my agent talked to people about it. In this organization you might get a chance to play in the big leagues, that’s why we decided to come here. DZ: One last thing, when you finally did get the call up this year, where were you and what was your reaction? RIVERA: I was just getting off the field, we had just finished practice. My manager called me and said “You’re going to the big leagues.” I was happy, (but) I wasn’t that surprised about it because I was working hard and just really wanted to get the chance to come here. I was excited about it and it’s good to be back in the big leagues. This entry was posted on Monday, June 13th, 2011 at 7:56 pm	and is filed under MLB, Twins. You can follow any responses to this entry through the RSS 2.0 feed. You can leave a response, or trackback from your own site.